Quality, Selection, Service, and Value. 43 Years serving Southwest Missouri. Our Very Best Double Smoked bone-In Ham. You'll never eat a better tasting ham! 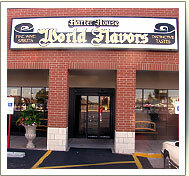 USDA Choice Standing Prime Rib Roast (Bone-In) or Boneless Prime Rib Roast The King of the Roasts. Cut any size you need. Harter House brought a touch of the west coast to the Ozarks. Seasoned FREE with either Pappy's or Santa Maria Seasoning. Send The Gift of Harter House Meats! Get 10% off your online order today! Use the coupon code: 10off. That's an even deeper savings from our already low prices! 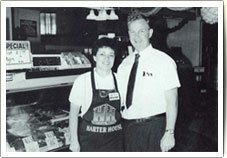 The Harter House family has been serving Springfield, Missouri and neighboring cities for three generations. We proudly continue the tradition that's kept our loyal customers happy, well fed, and coming back: We offer the highest quality meats and groceries, friendly and knowledgeable service that can't be beat, and values that help folks easily meet their budgets. 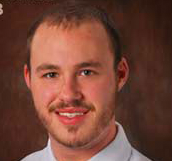 Alex is the Deli Manager at Harter House on Eastgate. He's just an all around great guy. He's a new employee to Harter House, hard working and fun. Away from work, Alex is a hockey enthusiast. Harter House is proud to report that our 2017 Jerry Bettlach / Jim Trimble Memorial Event to Benefit The Kitchen, Inc. raised just shy of $75,000. This money will be used to help stop homelessness in our community. Thanks to all who helped support this effort. 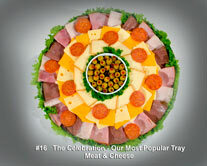 Make your Party prep work easier by purchasing a Party Tray from any Harter House location. 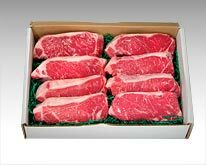 Every cut of our New York strip steak offers both rich, beefy flavor and marbling for increased succulence. Every cut we serve is exceptionally tender—choose from our choice cuts or try our dry-aged cuts and take flavor to the next level.